Is ceramic pro safe for my car paint clearcoat? Does ceramic pro fade,crack,peel or yellow? Can i apply ceramic pro to my own vehcile? Can a detailer,dealership or service center that is not certified apply ceramic pro to my vehcile? The process of Ceramic Pro will take between 3-7 days depending on the condition of your paint, the size of the vehicle and the packages you select. The 1st step is to wash and prep the vehicle. The 2nd step is to correct all the imperfections in the paint such as swirls and light scratches. Once the vehicle is properly prepped, a body shop safe prep solvent will be applied to the entire vehicle to get to bare paint. At this stage the coating process will begin, and each panel of the vehicle will have Ceramic Pro applied, leveled, and stacked to achieve the package you have selected. My car has swirl marks & other pre-existing damage, can ceramic pro be applied over this ? Can ceramic pro protect my vinyl wrap or ppf film? Yes, Ceramic Pro will protect your vinyl wrap and ppf film from accidental spills, stains, oil/grime, and UV rays. 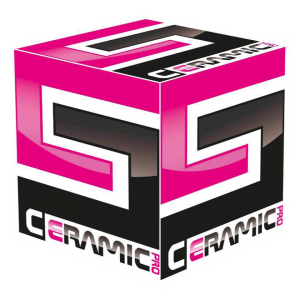 Ceramic Pro is completely flexible and will not crack or peel from your vinyl. As with all surfaces, Ceramic Pro offers a self-cleaning effect allowing your vinyl to be easily cleaned. Say goodbye to countless vinyl cleaning agents. Yes, the complete line of Ceramic Pro products are completely versatile. Ceramic Pro Rain is the product applied to glass to act as a water repellent. Please note that durability may be effected with excess use of windshield vipers. No, Ceramic Pro will not prevent water spotting, but it WILL allow those pesky waterspots to be easily removed without damaging the surface. Because Ceramic Pro creates a protective layer over the substrate, it does not allow the minerals to corrode or etch the surface that Ceramic Pro is protecting, prolonging the life of your metals, paints, gelcoat, plastics, vinyls etc. Ceramic Pro is a silica based/glass product and the glass on your windshield can still get water spots, but it is much more resistant to water spots than your clearcoat. Drying your vehicle after washing is a must! Will ceramic pro protect against stone chips? Ceramic Pro is a Silica based product, meaning it is a “glass” coating. Ceramic Pro adds some stone chip resistance, but it can still get stone chips from larger stones at high speeds. The glass windshield on your vehicle will still get stone chips, just much less often than your clearcoat. Ceramic Pro Gold Package has a Lifetime warranty. That’s longer than any wax or sealant on the market! Can ceramic pro be removed from my vehicle easily? Can ceramic pro get stained chemical marks? Yes, washing or applying chemicals while the car body is hot can cause stain marks. We recommend you wash your vehicle in the shade and when car body is cold. What do i use to maintain ceramic pro coating? That’s the great thing about Ceramic Pro Products. Water and a mild car shampoo will do the trick. Good bye harsh chemicals, clay bars, etc. We recommend using ceramic pro sport (quick detailer) to maintain your coating. Click here aftercare for more on do’s & dont’s. Do i still need to polish or wax my car after ceramic pro has been applied? No!!! Ceramic Pro Products are the permanent replacement to polish, wax and sealants. You can throw those products in the trash! Ceramic pro sport is the only product you need. Does the product require annual servicing? I have bird droppings & insect marks, when should i remove them? Can i take my vehicle to a hand car wash? We don’t recommend of the road hand car washes. Do it yourself or call out a reputable mobile detailer. Check out our aftercare page for more info.